You never know what to expect when you go to a Paramore concert! 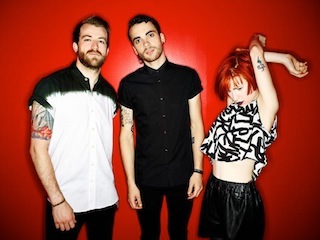 During the band's set at the Bunbury Festival in Cincinnati, OH, while they were playing "The Only Exception," vocalist Hayley Williams noticed some commotion happening in the crowd. "Do you guys want me to stop? Let’s just pause. Is everybody OK down there? Good? Not good? We’ll just hold on until everything gets cool," said Hayley when noticing their was a problem, despite not knowing what was happening until a fan shouted at her that a skunk was in the crowd! Once the problem was resolved, the band resumed their set. Remaining dates and ticket information for the "Monumentour" with Fall Out Boy can be found here.